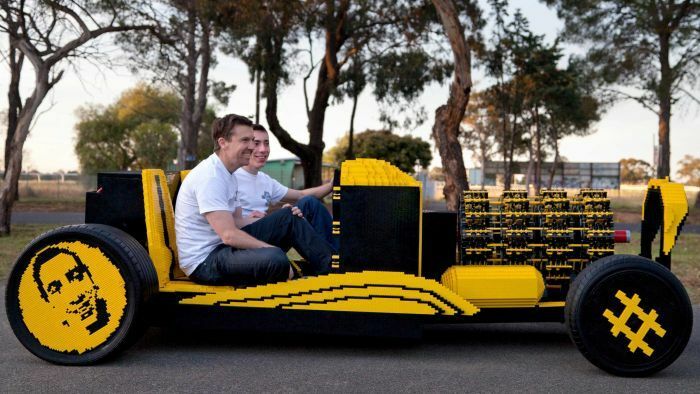 The world’s first life-sized, driveable Lego car has hit the streets of Melbourne. Internet entrepreneur and marketing expert Steve Sammartino managed the project with the help of young Romanian student Raul Oaida. In an interview with ABC News 24, Mr Sammartino said Mr Oaida was a technical genius. “He did all of the design work, built the engine, built the car… he is the technical mind behind it. He really is capable of anything,” he said. 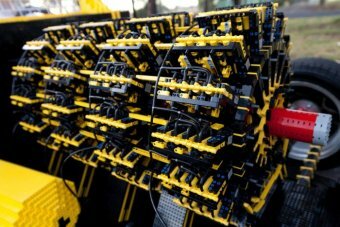 The black and yellow vehicle has been constructed almost entirely from half a million pieces of Lego. “The only things that are non-Lego are the four load-bearing struts and the wheels,” Mr Sammartino said. Mr Sammartino said even the lumbar supports for the seats have been made out of Lego. “I must point out that those seats are probably the most uncomfortable seats in automotive history,” he said. “But in order to stay pure to the project we wanted to make sure that all of the things including the seats and the clunky steering wheel – which is also uncomfortable – were made out of Lego. It doesn’t go all that far, but just the mere fact that it does go is quite something… It’s really a technical experiment to show what’s possible in a connected world. While the car might look flashy, Mr Sammartino said the vehicle was not going to set any land-speed records. “It doesn’t go all that far, but just the mere fact that it does go is quite something,” he said. The astounding vehicle is also ecologically sound.